Register Log In GliderCENTRAL Forums Glider Talk and Traveling HAPPY BIRTHDAY! I melted and figured what the heck, I should send out a notice. I came home and as usual they were on the cage yipping at me so I just let them out and both gliders were super hyper and I couldn't really tell which was which. Well actually I saw the one and it was all over me and was giving me nips so I figured it was herky because we are closer but he never bites. And his nails are nicely trimmed from running but now he was getting stuck.... well imaging my surprise when the real Herky stood up and made his presence known! While I distracted the parents with some goodies I peaked in the pouch and took a couple of quick shots. I can't wait to see the sexes. Until then they will temporarily be named.....Pomp and Circumstance. Tah Dah! to the party Pomp and Circumstance!!!! Here's a close up of Pomp and Circ. I was hoping they were going to move around so I could maybe check under the hood for make and model but they just slept... lazy babies! I'm going to do my best to keep a photo log of their growth. 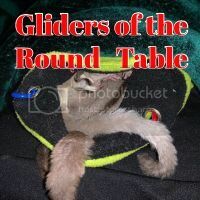 When can I introduce the babies to the two other gliders to see if they get along? I'm guessing not for another two months at least but I was just curious. Oh and has anyone had problems with the bottom of their cage being "bouncy" The first cage I bought I think was from exotic nutrition, im not sure. but it's the cheapest of all three and the bottom grate is really bendy. When the big wheels are a movin' they tend to bounce all around the cage. I have an invention (it's only in my head right now) But It's similar to the "tear away" goggles that racing motorcyclists wear. It would be an adhesive liner that would go on the inside of a wheel. It could have a slight abrasiveness to it or not but either way when the wheel becomes covered in poop, you just peel it off and slap on another one. These would be for the solid wheels and not the ones with the mesh obviously. HOLY CRAP either I am the dumbest person to ever turn on a computer or idk, one hour wasted trying to get a dumb avatar on here. not worth it. Last edited by billytense aka Lisa11; 07/19/18 04:33 AM. They are so adorable. I would have loved to experience grandparenthood, but our space is limited when we are on the road..At 8wks Oop, babies will be weining age. Intros I'm not real sure. I had to wait till Stewie grew a little more so he could hold his own with the girls. They are 4yrs old. Stewie is now 18 wks oop and starting to fill out more. I have a cage that has a bouncy bottom. I use zip ties and anchor to the side and floor of cage. I like your idea of rip off sand paper!!! Could you explain the zip ties to me? Like do you have them going at an angle from floor to side to form a triangle? Not really. Zip tie the up right of the stand to the cage wall, and a couple of zip ties to hold it down to the floor. Try to keep gaps between them to a minimum, or enough of a gap that won't catch toes or feet, yet smaller than what a head will fit in to.